For many of us that are fortunate enough to have dishwashers in our own homes, we may often take it for granted. Dishwashers simplify our modern lives and they ensure that our dishes are thoroughly clean and free from bacteria. To keep our dishes this clean and to prevent future dishwasher repair, it is important that you properly maintain your dishwasher. 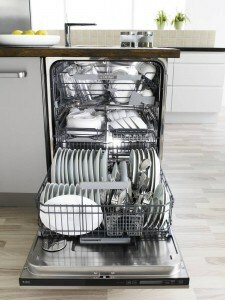 Many of us run our dishwashers on a regular basis and this is considered to be beneficial for the dishwasher itself. A typical dishwasher is designed to self-clean and eliminate clogs and other issues. Studies have shown that a dishwasher that is run on a daily basis will usually outlast a dishwasher that is only run once per week or less. Have you ever used your dishwasher only to open it again and find spots on your dishes? This is one of the most common issues that dishwasher owners encounter. Due to a vast range of environmental factors, spotting is a natural occurrence. Fortunately, this issue can be avoided through the use of a rinse aid, such as white vinegar. When your dishwasher completes its cleaning cycle, be sure to be prompt about unloading the dishes. If you see any debris that has been left behind, be sure to clear out the debris as well as clean the spinning arms after each washing cycle. In many cases, problems with the spinning arms will occur overtime; however, if you clean them regularly, most of these issues can be avoided. If you run your dishwasher several times throughout the day, you do not necessarily have to inspect the drain after each use; however, it is recommended to inspect and clean the drain after the last run of the day. If debris continues to build up at the drain, that debris will ultimately be forced through and may cause future issues. For many modern dishwashers, the most common spots in which debris may accumulate is around the bottom of the dishwasher door. It is recommended that you clean the door edges as well as the gasket of your dishwasher once per week. This can easily be done by using a damp cloth. If needed, a cleaning solution may be used as well. Regardless of how proactive you may be, blockage in the dishwasher’s drainpipe can occur. To clean the dishwasher drainpipe, simply disconnect the drain hose. On some units, you may be required to remove the kick plate first. If the hose is broken, you will certainly want to replace it. If the hose is not broken, run water through the hose to unclog it. If running water through the hose does not prove to be successful in unclogging it, it is crucial to avoid using chemical unclogging substances. If you require additional assistance, be sure to contact a certified repair technician. If you are having problems with your dishwasher, please contact us toll free at 855-358-1496.